I have always lived in Cornuda, in the province of Treviso, on a street called Via 30 Aprile 1945. This street was named in honor of the day the Allies arrived and liberated my town from the nazi-fascists. The pictures of the Sherman tanks and GIs advancing along the town, which I’ve seen so many times, have always instilled in me a great interest in the history of the Second World War. Several years ago, I began to search for information about those days, with my main interest being the American liberation troops. I did not find much about Cornuda in the information I received from the U.S. Army, or from searching on the Internet (the net was not very big at the time). Last year I built a website dedicated to an event of the Second World War, D-Day. When I finished, I decided to renew my search for information about Cornuda. I wanted to tell the events of Cornuda from a different point of view, as seen through the eyes of the American troops. After a long search and after buying some second-hand books in the U.S. and with the precious help of some American history lovers, I found what I was looking for. The events that happened in Cornuda more than 60 years ago were described in different sources such as reports, statements, official unit histories, and the memories of an American general, and a combat medic. All of the sources portray Cornuda as one of the last bloody fights that happened in Italy during the Second World War. When I view the pictures of the American soldiers sitting on the tanks advancing carefully along the streets, I have the proof of a gift for which gratitude will be never enough. Especially when I think that during that period, my grandfather was interned in a German prisoner camp and my grandmother was one of many other mothers terrorized by the war caused by a criminal irresponsibility of the nazi-fascists. A few months before the war, the American liberators were just average citizens. They were busy planning their future, thinking about what kind of career to undertake, or what college to attend, or they were saving money for their children’s future. Suddenly, they were catapulted into a war that neither they, nor their country, had caused or desired. Many of those young people probably had never travelled outside of their home state, let alone their country. 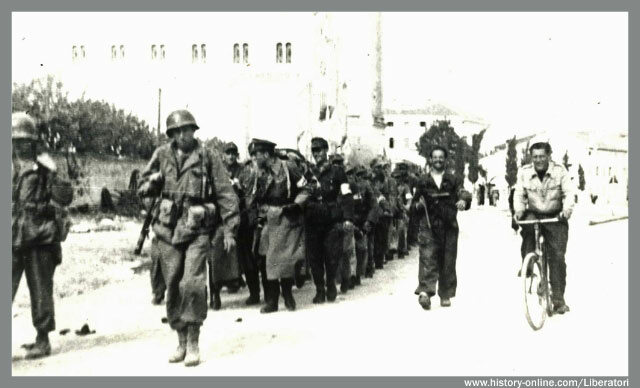 But they undertook the longest trip of their life, coming to fight in the streets of a small town in northeast Italy. They came to eradicate the most ignoble political and military order that has ever subjugated Europe, in order that nothing like it could be repeated in the future. In their journey, they had the support of so many other people that in various ways had chosen to refuse the dictatorship. In this website, I have created different sections to tell these historical events. In the Italian Campaign section, you will find a description of the reason that led the Allies to undertake the war in Italy. In the long walk section, the evolution of the Allied advance is described. In Verona to Cornuda I reported in detail the military operations of some of the most important Allied divisions destined to free northeast Italy, from the days of the Po River crossing, up until the end of the war. In the battle of Cornuda I described the fighting that occurred in Cornuda on the afternoon of 30 April 1945 and the following night. The original combat film shot during the fightings is available in the Combat film section. In the Pictures section, some old photographs are presented, compared with today’s reality. The Liberators section tells the history of the Allied units that participated in the liberation of Cornuda. In this page are also listed the documents and the sources of information that I have consulted, as well my thanks to those people who have helped me. With this website, I want to remember and honor the Allied soldiers and the partisans that fought for the liberty of everyone, especially the 88th “Blue Devils” Infantry Division, the 752nd Tank Battalion, and the 805th Tank Destroyer Battalion. If you like this web site and you found it interesting, please send me a message.